I read this article and wanted to share it with you: 4 Reasons to Finish a Read-Aloud You Don't Like https://blog.sonlight.com/finish-read-aloud.html. 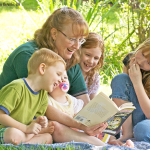 It can be a shock when, a few chapters into a book, you and your children are yawning as the pages turn. Maybe the story moves slowly or the vocabulary seems over your children's heads. You wonder, "What is wrong with us? This is supposed to be a great book! Everyone else loves it!" It happens to the most book-loving of homeschool moms and even with the best literature-rich curriculum. Book lovers only admit with great hesitation when we aren’t completely in love with a classic chapter book. We feel ashamed not to love every single award-winning book. But books are no different from movies or foods. Our preferences can't always be explained. Sometimes we just don't like a Read-Aloud. For example, I have never been a fan of Anne of Green Gables. I know, I know! How could I not adore this classic?! The irony is that my daughter loves the story of Anne of Prince Edward Island—probably because she is dreamy like Anne. To love or hate a book is simply a matter of preference, and neither we moms nor our kids should feel shame for disliking a book. My first run in with a difficult read aloud was Winnie The Pooh from History / Bible / Literature A. Something about it made me cringe at the thought of reading it each day. I persisted mainly because it was holding my daughter’s interest even if reading it made me want to pretend we were having a blustery day, curl up, and go to sleep. The dialogue was a bit confusing to read aloud if I didn’t get the voices of the characters just right. It made it difficult for me to push through, but we did get through it! 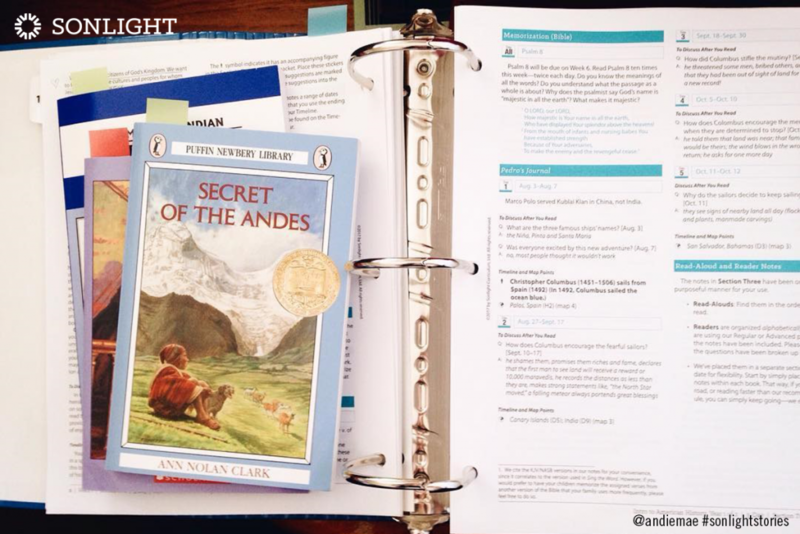 Later with History / Bible / Literature D I faced my child's first disliked Read-Aloud with Secret of the Andes. While I was on the edge of my seat reading with deep anticipation to solve the mystery of Cusi’s ancestors, my daughter couldn't get into the story at all. So when faced with a book that you or your kids aren't really enjoying, the question is should you finish the book regardless or wave the white flag of surrender? Often the answer is press on. 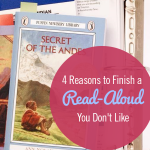 Here are four reasons to finish a Read-Aloud you don't like. A book with a slow start to the plot often has a real cliffhanger of an ending. If you give up on the book before getting deep into the plot, you will never know the amazing twist waiting just beyond that chapter. Red Sails to Capri (in History / Bible / Literature C) felt like it was dragging on and on through those first few chapters. But as the mystery grew, we were so eager for resolution we couldn’t put it down! Let the book catch you all by surprise. Keep reading! Sometimes the book you don't like ends up being a book you love. 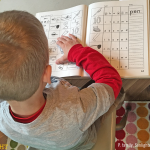 As a homeschool Mom I often find myself thinking I'm in charge of the lesson outcome. 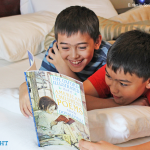 The truth is that God is always at work in my kids' hearts—even in our Read-Alouds. For example, last year smack in the middle of Adventures with Waffles (from HBL A), my son suddenly curled into my shoulder in tears. The year before his next door neighbor friend moved away. The story brought out the pain he had been bottling up inside. It was a turning point for him in learning to express when he is feeling hurt or sad. If we filter books out because we think they are boring or unnecessary, we may be missing out on important work the Holy Spirit is doing in our children's hearts or even in our own. This truth is often not a popular opinion, but that doesn’t make it any less true. Sometimes we need to read a book simply because it will teach us something we should know. I am glad my Mom forced—yes forced—me to read Anne of Green Gables. It is my first memory of getting caught in a lie told to my own homeschool Mom. When I turned in a terrible book report, she knew I didn’t read it and made me try again. Even though it wasn’t my favorite book, because of cultural literacy, I am glad I understand allusions to the romance of Anne & Gilbert. Yes, our goal is to make reading aloud fun, but pressing on to finish a book you don't like won't ruin that foundation. 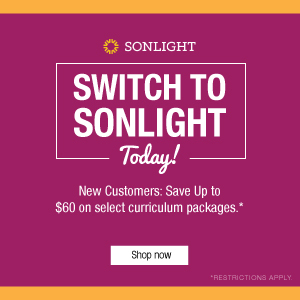 After a few years of using Sonlight, we have fallen in love with dozens of lovely stories. We have also persevered through more than a few books that started out (in our minds) as duds. Now I can see that finishing those books—even the less loved ones—has built character in my kids. Besides the lessons we learn through the stories themselves, persevering through a novel together teaches discipline. When we see that massive stack of completed books at the end of the school year—both the loved and unloved—we feel a sense of accomplishment together. 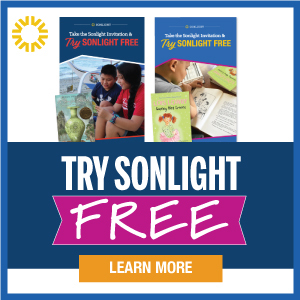 What has most surprised me about some of our least favorite Sonlight Read-Alouds is that they often become a favorite by someone in the family. 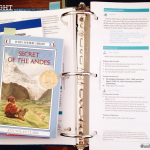 While I thought my daughter hardly heard Secret of the Andes, I was shocked to hear at the end of the school year that was her favorite book all year! Not only was she listening, she loved it. Winnie the Pooh wasn’t my favorite, but my kids look forward to it every time we rotate back to read it aloud to one of the younger kids. Red Sails to Capri started slowly for me, but now I wait with anticipation to read it aloud to my middle children next year. Although we sometimes run out of time to read all the books on our Read-Aloud list, I make it a rule to finish any book that we start. More often than not, I am grateful we did even if it was one I dreaded reading. 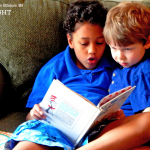 It’s okay to admit we don’t love all the books in our literature-rich curriculum! But let’s give them a chance before we toss them aside. Once you've finished the book, your opinion may change, and if it doesn't, at least your judgement is based on the entirety of the book. 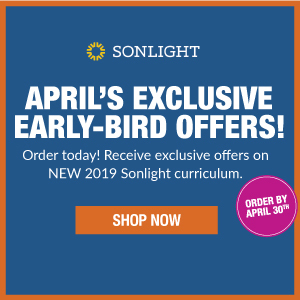 Try a Sonlight program, and take up to a year to see if Sonlight is right for your family with our Love to Learn Guarantee. 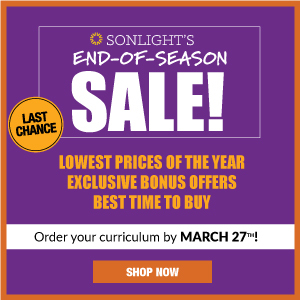 No other homeschool curriculum provider has such a comprehensive guarantee.